This patient came to Dr. Guarnieri with fractured, cracked molars. 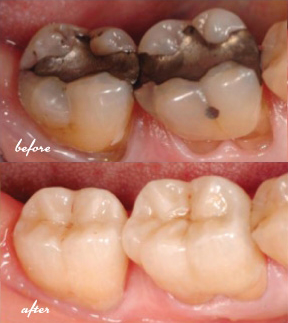 Their goal was to restore the teeth through dental treatment that would reduce the risk for future problems as well as a natural look. Dr. Guarnieri designed a restorative treatment plan with porcelain crowns that enhanced the health of the patient’s mouth and teeth. The team met and exceeded this patient’s expectations, leaving the patient happy they chose Pittsford Dental Excellence Center for their dental care.